What does it feel like to be overwhelmed by a hundred or so Philadelphia jazz musicians on a chilly morning outside of the John Coltrane House on North 33rd Street in the Strawberry Mansion section of the city? Publicist Graziella D’Amelio, who was checking people in when they arrived, said she felt like she was “on a receiving line at one of the most special family gatherings. I was leaning on a stoop next door to the Coltrane house , holding down photo release forms with one hand while receiving kisses and warm greetings from musicians and vocalists. It was a fun crazy morning.” And so it was. 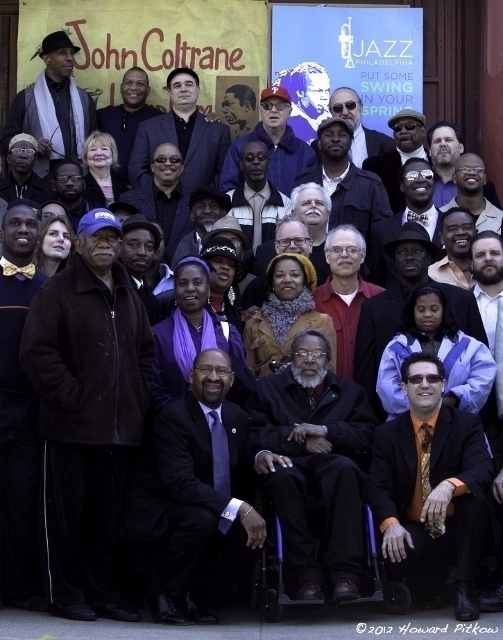 To celebrate Jazz Appreciation Day in Philadelphia this year, Gary Steuer, chief cultural officer in Philadelphia, decided to solo without a net and make a major commitment to really show off one of the city’s chief cultural resources – the jazz community – by assembling almost every jazz musician in the area for another Great Day in Philadelphia photo shoot. Last year, I raked the city over the coals a bit in my column because the mayoral press conference celebrating Jazz Day belly flopped badly when Steuer’s office somehow skipped over local luminaries and asked the wonderful bassist Ron Carter (from Michigan) to discuss the revered tradition of Philly jazz. But today made up for all that. Gary Steuer reconstituted the city’s Jazz Coalition, a collection of presenters, musicians, and educational institutions, gave it some mojo and let ‘er rip. 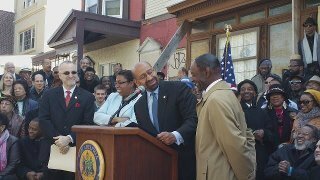 Combining the day’s celebration with a more suitable press conference from Mayor Nutter, the photo shoot would highlight the distressed condition of the Coltrane House, which had fallen into severe disrepair ever since Mary Alexander, Trane’s “Cousin Mary,” went into a nursing home, and jump start the fundraising; to renovate the National Historic Landmark. Almost everyone was on the scene this morning: drummer Mickey Roker cracking jokes with the other drummers congregating around him, saxophonist Odean Pope smiling and laughing with old friends, singer Miss Justine kissing every cheek in sight, guitarist Jimmy Bruno looking stunned by the size of the crowd – so many up and coming musicians and old heads were there, and a few people nobody recognized at all. Then, before venerated music teacher Lovitt Hines from the Philadelphia Clef Club conducted his young students in the Coltrane tune “Impressions,” 92-year-old drummer Charlie Rice was brought to the podium to say a few words and accept a proclamation from the Mayor. The press conference didn’t last long. After Mayor Nutter stopped speaking sweetly off the cuff, he consulted his prepared notes and stunned everyone by mentioning Bobby Rydell. But nobody cared – they loved him for being there and reaching out to a community that has hungered for some recognition in their own city for a long time. Elena Bouvier, the talented photographer who took the last Great Day in Philadelphia photo in 1995, elbowed an AP photographer to her left and got the shot, capturing a moment in time that everyone knew would play out differently later as personal reminiscences tinkered with the memory. For more information visit Blogathom.